94-year-old McLeansboro resident Kermit M. Webb died at 2:17 p.m. on Friday (April 12th) in McLeansboro. He was the retired owner of Webb Oil Company in McLeansboro and attended the McLeansboro First United Methodist Church. He was born on November 4th, 1924, in McLeansboro to George Webb, Sr., and Grace (Thompson) Webb. He married Mary Elizabeth (Stephens) on February 1st, 1947, in Morganfield, Kentucky, and she preceded him in death on November 28th, 1996. Kermit graduated from M.T.H.S. in 1942 and was called to serve into the U.S. Navy during WW II. After returning from the war, he became a driver for Mid-Continental Oil Co. In time, he became an agent for D-X Oil Co., Sunray D-X and then Sunoco Oil Co. 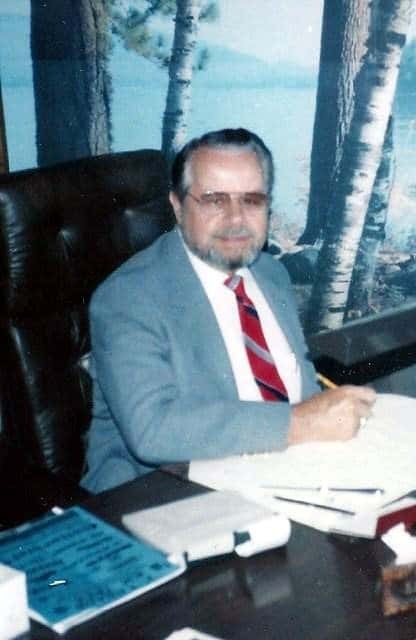 In 1977, the family joined him to form Webb Oil Co, Inc, a jobbership, representing Sun Oil Co. When Sunoco pulled out of Illinois, the company represented BP Oil Co. He served on the Hamilton County Soil Conservation Board, was a member of the American Legion Post 106, a lifetime member of the VFW and a 50-plus year member of the A.F.& A.M. Lodge 137 of McLeansboro. He loved traveling, camping, enjoyed the Lincoln Landers Motorhome Club and enjoyed “the Coffee Group in McLeansboro”. He really loved riding his Can-Am cycle in warm weather and deep sea fishing with his friends at Bayside Estates in Florida. Kermit Webb is survived by two daughters: Paula (Bob) Young of Carmi and Linda (Bill) Gwaltney of Benton; four grandchildren: Paul Young, Stephanie (Derrick) Evans, John (Julie) Gwaltney, and Kent Gwaltney; two great-grandchildren: Madison and Will Gwaltney; one brother: Ron (Linda) Webb of McLeansboro; and several nieces and nephews. He was preceded in death by his parents, wife, brother George Webb, Jr., and sister Wanda Fern Nieman. Visitation for Kermit M. Webb will be held from 6 to 8 p.m. on Monday (April 15th) at the Harre Funeral Home in McLeansboro. A Masonic Service will be conducted at 7. Funeral services will be held at 11 a.m. on Tuesday (April 16th) at the funeral home, with Reverends Leland Widick and Russell Anderson officiating. Burial will be in I.O.O.F Cemetery in McLeansboro. Graveside Military Rites will be conducted by American Legion Post 106 and a U.S. Navy Military Honor Team. Memorial contributions may be made to the First United Methodist Church and will be accepted at the church or Harre Funeral Home.